In the late 19th and early 20th century the widow of the extensive Winchester Repeating Arms fortune spent much of her later life building a vast and sprawling mansion. Under Sarah Winchester’s guidance, workman creating a maze of corridors, stairs and rooms, reportedly with the purpose of confusing the spirits killed by her families weapons. The building still stands to this day, and its strange tale has often found its way into horror films and literature. Drawing inspiration from an intriguing real life location, and the unique woman that built it, Australian writer/directors the Spierig Brothers have once again taken a tilt at horror genre in Winchester. Despite being sent into a spiral of grief (and laudanum addiction) due to the tragic death of his wife, Doctor Eric Price (Jason Clarke), is hired by the Winchester Repeating Arms Corporation to assess the mental state of their controlling share owner, the widow Sarah Winchester (Helen Mirren). He discovers a building under constant construction, a confusing network of rooms springing forth from Sarah’s communications with the spirit world. Yet there is something else, a sinister presence that threatens the Winchesters and Price, something that is gaining in power, as its day draws closer. In many ways Winchester is more of a traditional Gothic haunted house film rather than a modern horror film. Not merely a case of the set and costuming harken back to the old Hammer Horror films, but the style of the tale does as well. It is pitched much more with the intent of setting up a fascinating premise and exploring some interesting (and period appropriate) ideas about the afterlife, rather than excessive gore. In some ways it is even less lurid and exploitative than many of Hammer’s range, a step back by the Spierig Brother’s from their last outing, as they tone down their pulp sensibilities. The results are an improvement from Jigsaw but still not representative of them at their finest. They’ve created more of an intriguing piece, rather than a genuinely great horror film. In part this is due to Winchester just falling into that middle ground. It’s neither complex enough in terms of plot (Winchester is a little too reliant on some very familiar genre tropes) or frightening enough in terms of scares. As such it is probably going to struggle for an audience. What it does, it does competently, bringing the labyrinthine world of the Winchester estate to vivid life, but despite nailing the aesthetics and the tone, it doesn’t feel like it quiet accomplishes enough in terms of any greater themes it is trying to convey, or to be evocative emotionally. It certainly does have its cast working in its favour. Jason Clarke takes a solid turn as the haunted (both figuratively, and literally) Dr Price, able to convey the upright physician and the self-destructive grieving husband with equal poise. He holds his own against Helen Mirren, which is a minor miracle after his turn in the meltdown that was Terminator Genisys. 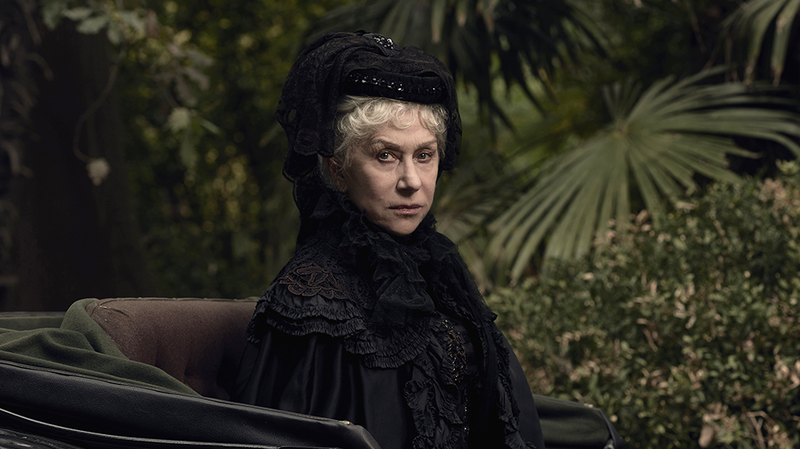 Mirren (of course) is in a league of her own, selling the role of upright business matriarch turned spiritualist. You could easily see her character sharing tea with the shade of Mary Todd Lincoln. Sarah Snook on the other hand, is given little to work with, and her talents feel wasted in a minor role. An adequately executed horror, but Winchester fails to make the best of its intriguing premise and strong cast.